"She&apos;s giant!" 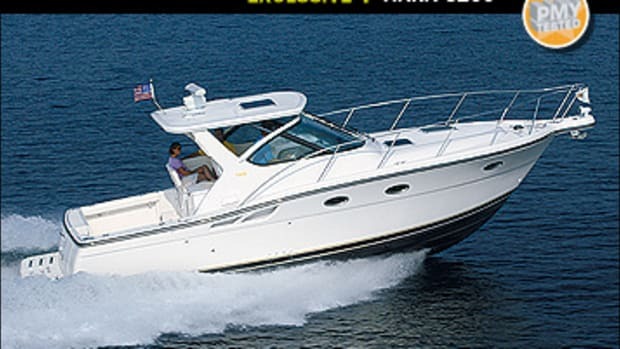 I said, letting an appreciative eye slowly descend from the 4-kW Raymarine radar antenna towering above us, over the swept-back curves of the enclosed hardtop, the beefy but jewel-like rubrail, and finally down along a hull side that was as creamy smooth as it was vast, resolute, and seemingly immobile. "Yeah, Bill," concurred Young as he handed a well-traveled Pelican case off to Tiara&apos;s marketing rep, Dave Walsh, standing on the swim platform. "She&apos;s a bit larger than what I&apos;m used to, I&apos;d have to say." We began checking things out immediately. And the immensity we&apos;d picked up on while appraising the 5800&apos;s sleek exterior clearly predominated everywhere else, particularly in the machinery spaces, accessed via a cockpit hatch with gas-assisted cylinders. Talk about elbowroom! 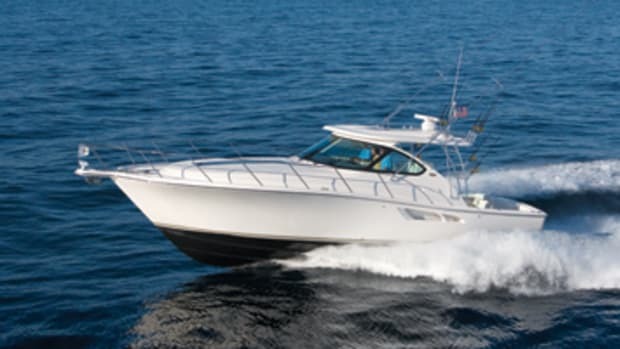 Once Young and I&apos;d entered the engine room, Walsh came down, too, along with Evan Dufendach, the Tiara captain whose main job is to familiarize new 5800 owners—and 5800 owners only—with their boats. Although all of us are of average or above-average height, there was still plenty of room to sit around talking about the top-shelf engineering details that were nearby, including a veritable arsenal of AGM batteries (eight engine start and eight service), a standard genset and air-conditioning system, high-end Victron battery chargers, and a FRP fuel tank. 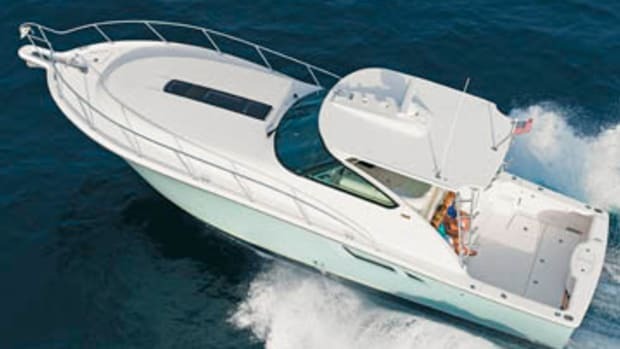 Of course, the primary reason for the expansiveness was the 5800&apos;s extraordinary propulsion package: three 435-mhp Volvo Penta IPS 600 pod drives. Walsh said their compactness engenders so much extra space that Tiara plans to offer future versions with another stateroom (or crew quarters) just abaft the engine room&apos;s forward firewall. Once we&apos;d exited the machinery spaces, Young and I discovered there was way more to the 5800&apos;s interior than mere elbowroom and savvy engineering particulars. To begin with, natural light was an obvious priority. 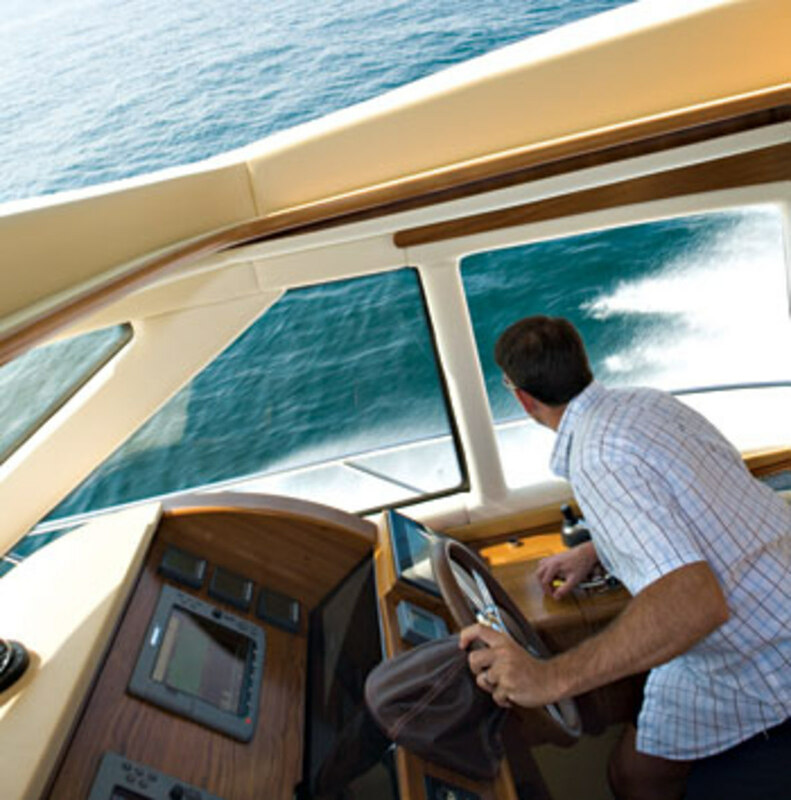 We stood near the raised helm station—a few steps above the saloon to our rear and the windshield-brightened "Sky Galley" with its adjoining lounge/dinette area some steps below—as Walsh noted, "This boat offers approximately 57 percent more natural light than our previous flagship, the 52." I glanced about, at the electric sunroof overhead, the panorama of doors and windows circumscribing the saloon, and the sunlight streaming down from a Bomar deck hatch into the galley, and nodded at the statistic. Then there was the solid, Midwestern craftsmanship Tiara&apos;s justly known for. As we toured the 5800&apos;s below-decks accommodation spaces, with a VIP beyond the galley/dinette area (that has private access to the day/guest head to port) and full-beam master aft (with en suite head and molded-in hull-side windows for extra light), we noted a remarkable level of finish. Decks were finely laid with real teak planks, not artificial ones. 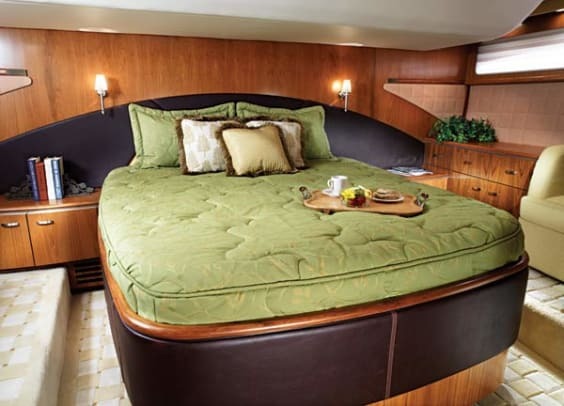 Berths were oversize, with cushy innerspring mattresses. Kohler faucets and other plumbing fixtures were classy and robust. Teak joinery was flawless, and solid brand names were everywhere, from the Denon entertainment electronics in the saloon to the Vitrifrigo refrigerator /freezer drawers in the galley. "All this is great," said Young somewhat impatiently as I counted the scads of lights in the master, "but what about the actual sea trial?" I grinned at Walsh. I, too, was interested in seeing how the 5800 would perform, especially in dockside maneuvers. After all, I had a fair understanding of how marine engineers got vessels with even numbers of computerized pod drives to walk sideways and do other tricks, but what about an odd number? What about that third, asymmetrical unit? Dufendach fired up the three engines and then promptly laid the question to rest. When handled dockside, he explained, the central IPS unit would drop out of the picture, so to speak, leaving the two outboard units to run the show. "Check out our wake," he advised, nodding over his shoulder. "And you&apos;ll see only two propeller streams at maneuvering speeds, not three." Once we&apos;d reached Lake Michigan, the wind slackened off and the sea turned pancake flat. With Young holding the clipboard as I stood on a helm seat and rather breezily shot radar-gun speeds out the sunroof (windshields render radar return inaccurate, in my opinion), we recorded a respectable top hop of 38.9 mph. Handling was radical. Whether it was Young (with a smile on his face as wide as the wilds of his native Ontario) or me at the helm, the 5800 swooped into tight, highly banked turns with the vivacity of an after-burning fighter plane. Visibility ahead—and everywhere else, for that matter—was excellent at all running angles. And sound and vibration levels were modest, not only because of the sound-absorbence inherent in a resin-infused, balsa-cored hull (and hand-laid balsa-cored deck), but also because of the big O-ring isolators cushioning our three IPS pods and the soft IPS mounts on the engines. Dockside maneuvering upon returning to the Yachting Center brought up my only criticism. Backing the 5800 into her slip didn&apos;t go as smoothly as I expected. Not that there were any great difficulties—I simply failed to continuously maintain power going astern with the stick, thereby inadvertently causing the drives to center themselves once or twice, a fumble that typically slows rearward progress. Why the lack of grace? Hmmmmm. I&apos;m a right-handed guy—a very right-handed guy—and all the joystick vessels I&apos;ve handled dockside over the past couple of years have had either centerline joysticks that facilitated right-handed operation (Tiara&apos;s 3900 Sovran, for example) or to-starboard joysticks with helm configurations that still made it possible (Lazarra&apos;s LSX Quad 75 comes to mind). That&apos;s why I mastered them quickly. And why our test boat&apos;s to-starboard arrangement (which, because of the helm chair location, was not amenable to right-hand usage) proved trickier. Sure, Tiara offers an optional joystick in the 5800&apos;s cockpit that&apos;ll do for right-handed operators as well as accommodating southpaws. 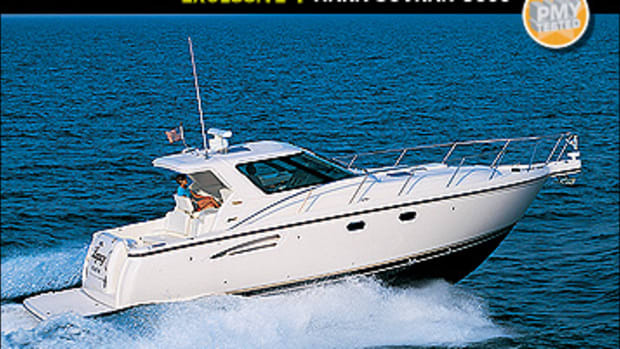 But why not go with a standard, centerline setup at the helm that works for both? Or better yet, why not mount the joystick in the helm-chair armrest—right or left, depending on customer preference? 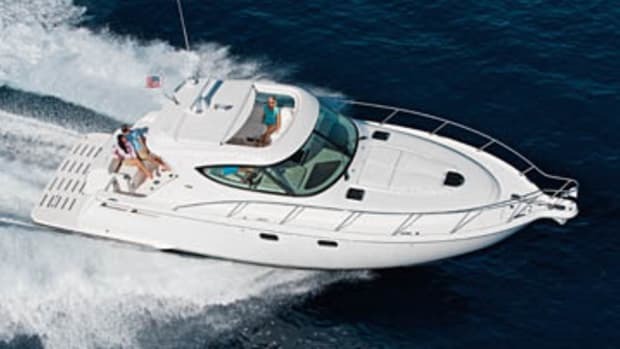 For more information on Tiara Yachts, including contact information, click here. 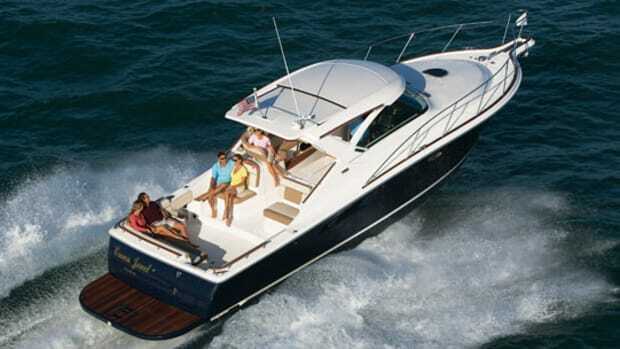 Although it had a high-tech design partnership going with well-known naval architect Tony Castro on the 5800 Sovran project (and a performance-validation agreement with Donald Blount & Associates as well), Tiara also tweaked the boat&apos;s layout via a more low-tech, old-fashioned methodology—company craftspeople built a full-size, precisely correct replica of the 5800’s interior out of plywood and other materials and made sure designers, engineers, and additional interested parties did plenty of walk-throughs before signing off. Shown above is this full-size mock-up. Besides obviating layout glitches and goofiness, it helped employees engineer the big, modular interior module that’s lowered into the 5800’s hull during the building process and secured with electrical, plumbing, and other components that are already installed.—B.P. So You Wanna Test a Boat? Earlier this year I’d convinced PMY I was qualified for the job—sort of. "Maverick, never, ever leave your wingman." 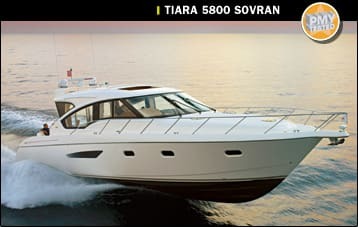 While flying from Toronto to test Tiara&apos;s flagship 5800 Sovran, I couldn&apos;t help but think of that Top Gun mantra and the fact that my brother Don, co-winner of PMY&apos;s Boat Test Contest and the only true yachtsman in the family, would not be manning the helm of our test boat. I&apos;d be on my own—a weekend warrior and wannabe, more accustomed to popping corks and slicing brie onboard than facing the solo challenge of navigating a world-class yacht and subjecting himself to the scrutiny of PMY readers. My resume for the privilege wasn&apos;t fabricated. Due to an errant docking in my youth, I have required the services of a fiberglasser. For a parental stay-of-execution, I once treated the family boat to a Liquid Paper paint job. Consequently it was always Don (now a successful yacht broker on Vancouver&apos;s Granville Island who had to forego his testing role as a result of conflicts of interest) who always handled the finer points of boating—minor tasks like actually driving and docking. Back in the day, my ability to spin a yarn for Don&apos;s scholastic advancement elicited the use of his personal Sidewinder knockoff. When PMY offered up a boat for a day in exchange for editorial content, I stepped up, regaling the editors with an account of our youthful exploits, brotherhood, and somewhat dubious motivations. 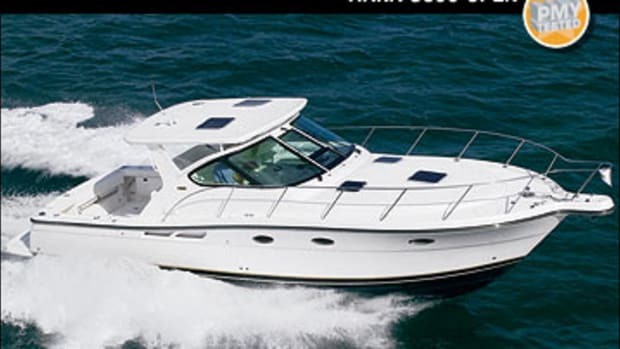 My compatriot for this boat-test adventure was Capt. Bill Pike—a nautical man known to many readers for his years of service in yachting journalism. Pike has driven everything from Gheenoes to freighters, but you wouldn&apos;t have been blamed for wondering if it was his first time behind the wheel of a rental car. Admittedly, he prefers the open water to the open road, and I suspect that if the highway from Grand Rapids to Holland, Michigan, had been marked with green and red buoys, we probably wouldn&apos;t have gotten lost. The extra time in the car made for an enjoyable icebreaker as Pike openly shared stories of his life and filled me in on our itinerary, which would commence with a tour of the Tiara factory. Thanks to Pike&apos;s easy style, it wasn&apos;t long before my jitters subsided, replaced by the anticipation of the day ahead. My few words here most likely won&apos;t do justice to the 5800 Sovran or the procedures Tiara uses to construct her. More than 16 football fields in size, the 800,000-square-foot facility we toured is a manufacturing marvel, its entrance graced by a lovingly restored 1955 SlickCraft that is a tribute to the heritage of Tiara and founder Leon Slikkers&apos; early days as a builder. Tiara&apos;s marketing director, Dave Walsh, proved a gracious and knowledgeable host. Tiara owners-to-be are welcome to visit the plant—an offer, according to Walsh, accepted by an estimated 80 percent of purchasers. No matter where you live, it&apos;s worth the trip, in my opinion, to see your new Tiara passing through the dedicated hands of the Tiara family of employees. From the exquisitely manicured lawn of Tiara&apos;s Yachting Center on Lake Macatawa, I caught my first glimpse of our test boat, and my jitters returned. Don&apos;t pretend you haven&apos;t had them—the butterflies that flock to your innards as you anticipate handling a boat that&apos;s a little out of your league. Add to that a couple of Tiara big wigs, one senior PMY editor, a camera crew, and, well, you get the idea. As it turned out, my trepidation was unfounded. First off, one of those Tiara fellows turned out to be Evan Dufendach, a Tiara test captain who eased the 5800 Sovran away from the dock with the assistance of Volvo Penta&apos;s IPS joystick and no help from me. And second, I always had Pike riding shotgun. Out in Lake Michigan we put our test boat through her paces by making multiple passes for radar-gun readings and recording fuel-burn rates, running attitudes, and other data at the various rpm levels. The Tiara made short work of the chop and felt more like a muscled runabout than her 50,000-pound displacement would suggest. 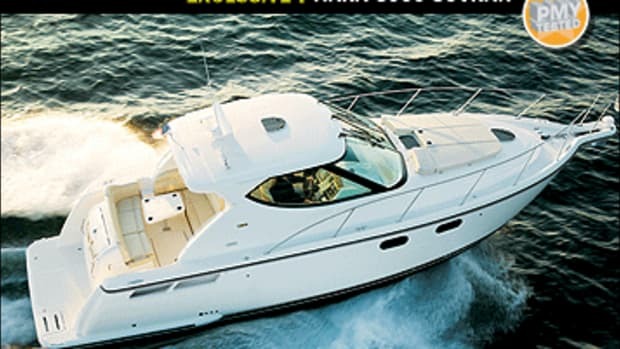 Fear turned to healthy anticipation as I took my turn at the helm and promptly opened up her three Volvo Penta IPS 600s. Trust me! If fortune ever affords you the opportunity to seize the wheel of a 5800 Sovran, be sure to open the large sunroof, drop the expansive starboard window, and carve yourself a tight right-hander, throttles wide open. The blue water blurs by, seemingly close enough to touch, sending pure exhilaration coursing through your veins. A seasoned vet? Not quite, but that&apos;s how Walsh referred to me after five minutes of maneuvering near a buoy in Macatawa with the joystick. IPS drives really make it that easy. Literally anyone can look like a pro with this system, which takes the angst out of docking in tight or windy conditions. Back at the dock Pike went through all the features of the yacht after docking her stern-first with the joystick. 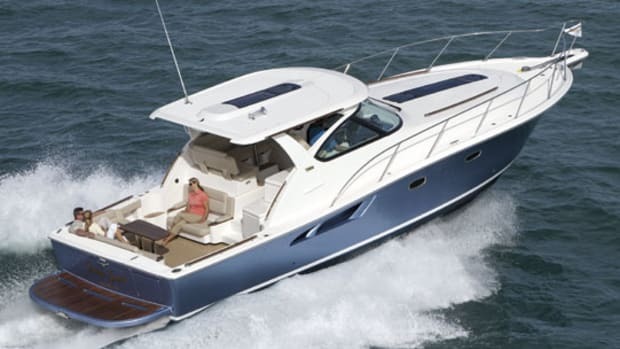 A testament to the buzz the boat&apos;s already created, Walsh informed us that, as of test time, Tiara had already taken 17 orders for the 5800. So, you wanna test a boat? Conjure up your best story, and take a crack at persuading the PMY editors. If you in fact win, you can expect to get the royal treatment. I did—from the accommodating folks at Tiara and PMY along with Jeremy Frechette and Greg Higle, our two onboard photographers. Many thanks to all for this fantastic adventure. And oh, one last thing...Capt. Bill, you can be my wingman anytime!